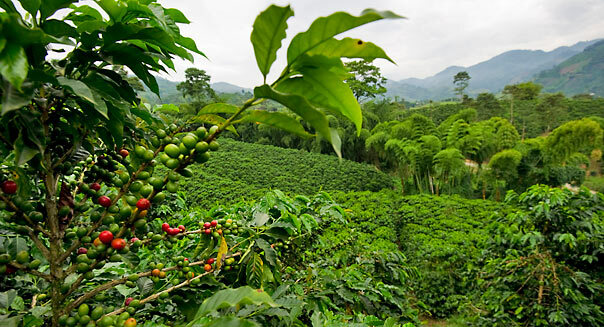 Starbucks (SBUX) goes into the farming business: The coffee retailer has bought its first farm – a 600-acre property in Costa Rica. This doesn't mean that baristas will have to pick their own beans, but Starbucks hopes its move into agriculture will benefit the entire coffee-growing business. The Seattle-based chain already offers 55 different varieties of coffee. You can get anything from a basic medium roast to a sun-dried Sumatra Rasuna or a Peppermint Mocha. And now that the company has its own farm, it will be able to develop proprietary coffee varietals, which could lead to new blends. Starbucks will also develop hybrid coffee beans, but it will not use genetic modification techniques. That's part of the company's commitment to ethically source all of its coffee beans by 2015. In addition to creating new coffee varieties, Starbucks says it intends to use the new farm as a basis of research that will help coffee farmers around the world. One priority is to investigate a fungus, known as leaf rust, that is devastating crops in Central America and Mexico. It kills coffee leaves by sapping them of nutrients and lowers bean yields. An international trade group estimates the fungus could wipe out 2-1/2 million of those giant bags of coffee this year, and as much as 4-million bags next year. Starbucks also says its research will focus on finding new methods to grow coffee, on farming techniques that improve coffee production, and on mitigating the impact of climate change. The company says it will share what it learns with other coffee farmers to improve the quality and size of the worldwide harvest. Starbucks has more than 17,000 coffee shops in 40 countries. So how much coffee does it need to meet our thirst for these coffee brews? It bought 545 million pounds of coffee last year. And the company's stock has been a winner, even though growth has slowed: It's up just 6 percent over the past year, but it's more than doubled over three years, and it's soared 250 percent over five years. What it does: Eni (E) is an Italian energy company that combines all three major businesses of the oil and gas industry -- exploration and production, transport and storage, and refining and marketing -- under one corporate umbrella. Why it's a bargain: Italy has been near the epicenter of the European financial crisis, and the results of its recent election sent its stock market plunging as many investors fear the new government could undo hard-won austerity measures and send the Eurozone back into economic chaos. Eni fell along with its home market, but it has a global energy business that's more dependent on worldwide conditions than on those in any one area. With the stock trading at just eight times earnings, Eni's price makes its shares attractive even given the headwinds Europe faces. What it does: Tata (TTM) is an Indian automaker producing cars and trucks for both commercial and personal use. Although it's gotten its fair share of publicity globally for its $2,000 Nano compact car, it is less widely known as the company that now makes luxury brands Jaguar and Land Rover. Why it's a bargain: India is still growing at a much faster rate than the U.S., but forecasts see that growth rate slowing this year. And while it dominates the low-priced car market in India, Tata has seen margins at Jaguar Land Rover fall sharply. Nevertheless, the share price already reflects much of this expected slowdown, and with the stock fetching just seven times what it has earned in the past 12 months, Tata has great long-term potential once India gets back into faster-growth mode. What it does: Telefonica (TEF) is a Spanish company providing telephone, Internet, and video services to customers in Europe and Latin America. Why it's a bargain: Like Italy, Spain has had major economic troubles that have contributed to Europe's overall problems. To conserve cash, Telefonica decided to suspend its lucrative dividend, which scared some income investors out of the stock. But with its Latin American business still doing well and the stock trading at just seven times earnings, Telefonica has both promising growth prospects and a bargain share price to compensate shareholders of taking on some European economic risk. What it does: Seagate (STX) is a major manufacturer of hard drives for computers. It moved its headquarters to Ireland in 2010, but it still has extensive operations in the U.S. and elsewhere around the world. Why it's a bargain: The rise of tablets and smartphones has hurt the PC industry, which is a big buyer of hard drives. Moreover, as newer technologies like solid-state drives and flash memory become even more cost-effective, investors fear that Seagate's traditional disk drives will become obsolete. Yet Seagate has taken steps to stay relevant with its own solid state drives, and with a price-to-earnings ratio of just 4, even anticipated declines in net income don't make the stock look expensive. What it does: AstraZeneca (AZN) is a U.K.-based pharmaceutical company. Its best-selling drugs have included cholesterol drug Crestor and its Nexium acid-reflux drug. Why it's a bargain: AstraZeneca has been hit hard by the loss of patent protection on some of its blockbuster drugs, especially the antipsychotic Seroquel, sales of which dropped by $3 billion last year due to generic competition. But there are other drugs in its pipeline that could eventually replace the profits generated by those past blockbusters, including diabetes treatment Bydureon. At this point, AstraZeneca's P/E of 9 reflects patent-loss pessimism and leaves room for upside if the company's stable of drugs in development pans out well. Millions of American investors never invest in companies outside the nation's borders. But by broadening your horizons, you can take advantage of great opportunities that they'll miss.